North Atlantic Books, 9781583949375, 230pp. The Cannabis Manifesto is both a call to action and a radical vision of humans' relationship with this healing but controversial plant. Steve DeAngelo, the founder of Harborside Health Center, the world's largest medical-cannabis dispensary, presents a compelling case for cannabis as a wellness catalyst that must be legalized. His view that there is no such thing as recreational cannabis use challenges readers to rethink everything they thought they knew about marijuana. The Cannabis Manifesto answers essential questions about the plant, using extensive research to fuel a thoughtful discussion about cannabis science and law, as well as its biological, mental, and spiritual effects on human beings. With a cultural critic's eye peering through the lens of social justice, DeAngelo explains how cannabis prohibition has warped our most precious institutions—from the family, to the workplace, to the doctor’s office and the courtroom. In calling for a realistic national policy on a substance that has been used by half of all Americans, this essential primer will forever change the way the world thinks about cannabis, its benefits, and the laws governing its use. Steve DeAngelo has been a cannabis activist, advocate, entrepreneur, and educator for almost four decades. His vision and leadership have been featured by news teams from around the globe including the New York Times, Washington Post, CNN, Associated Press, Wall Street Journal, NPR, and BBC. His creation of the landmark Harborside Health Center, the largest medical marijuana dispensary in the world, set the standard for providing safe access, responsible use, and lab-tested, high quality medicine. In 2010, DeAngelo launched the cannabis industry’s first investment and research firm, The Arc View Group, one of the top ten angel investment groups in the U.S.
“I don't know that there's anyone on the planet right now who possesses Steve DeAngelo’s level of business savvy and knowledge of the cannabis plant. When he offers up his wisdom, people should listen and try to soak up as much knowledge as they can. I know I do." "Steve DeAngelo is the kind of devoted activist who normally would get hospitals and schools named after him, if he had been advocating something more mainstream. He is articulate, fiercely tenacious, and lives by his own principles, in life and in business. But as our recent history has shown, he might have something more important than a monument—a victory." "Steve DeAngelo has been an icon in the cannabis movement and industry for a very long time. I don't know that there's anyone on the planet right now that possesses Steve's level of business savvy and knowledge of the cannabis plant. When Steve offers up his wisdom, people should listen and try to soak up as much knowledge as they can. I know I do. 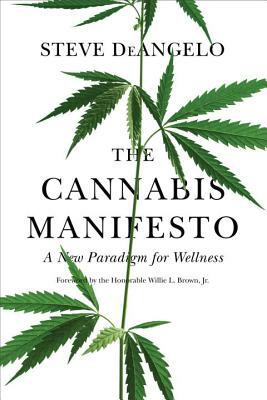 The Cannabis Manifesto is a book that every cannabis enthusiast should have on their bookshelves." —Ethan Nadelmann, Founder and Executive director of the Drug Policy Alliance.